Hillary Clinton’s swing state numbers: Quinnipiac poll shows Clinton trailing Scott Walker, Marco Rubio, and Jeb Bush. Does Hillary Have a Swing-State Problem? 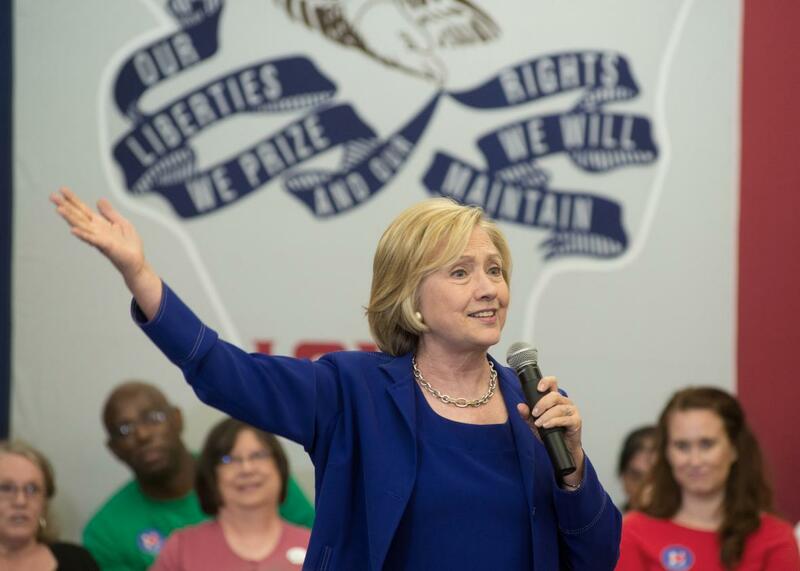 Hillary Clinton addresses supporters at a rally on July 7, 2015 in Iowa City, Iowa. Clinton’s favorability rating in the Hawkeye State? It’s in Trump territory. Despite Bernie Sanders’ best efforts, Hillary Clinton remains on pace to secure her party’s nomination this summer. Assuming the overwhelming Democratic frontrunner makes it to the general election, though, potential trouble may be waiting. A new Quinnipiac University poll out Wednesday finds Clinton trailing in a pair of important swing states and locked in too-close-to-call races in a third with the GOP’s Big Three: Scott Walker, Marco Rubio, and Jeb Bush. In a hypothetical match-up among registered voters in Colorado, Clinton trails Walker by 9 points, Rubio by 8 points, and Bush by 5 points. The news is similar in Iowa, where the former secretary of state trails Walker and Rubio both by 8 points, and Bush by 6 points. And in Virginia, Clinton trails Walker and Bush both by 3 points, and Rubio by 2 points—although given the survey’s margins of error, those match-ups are too close for the pollsters to call either way. When Quinnipiac asked the same questions in April, Clinton had clear leads in five of the matchups, and split the remaining four too-close-to-call face-offs. President Obama won all three states in both 2008 and 2012. The news looks even worse for Clinton when you dig further down into the polling tabs. Clinton saw her favorability ratings take a tumble among voters in all three states over the past three months. In Iowa, for example, voters were largely split down the middle in April, with 45 percent saying they viewed her favorably compared to 47 percent who said they didn’t. Flash-forward to July, and only 23 percent had a favorable view of her compared to the 56 percent who had an unfavorable one. Just how concerned should Hillary be about her 23-point gap? Let’s put it this way: The only candidate on either side of the aisle with a worse favorability deficit in the Hawkeye State was Donald Trump. The latest numbers are sure to prompt some handwringing from Team Hillary—along with some cheering from Team GOP—but it would be a mistake to read too much into one set of swing state surveys. The new numbers could be an early sign of a shift—or they could just be a few blips on the radar. Nationally, Clinton continues to fare much better in general election match-ups. In RealClearPolitics’ rolling average, she leads Walker by more than 10 points, Rubio by more than 7 points, and Bush by nearly 6 points. Regardless, July 2015 is a long way away from November 2016. Once the GOP finally settles on a candidate, perceptions of that man or woman is certain to shift as voters learn more about him or her. (OK, fine, it’s going to be a man.) Even in Iowa—where voters are exposed early and often to White House hopefuls—more than a third of respondents said that they hadn’t heard enough about Rubio or Walker to have an opinion about them. Hillary, then, has plenty of time to try to right her own ship—and sink those of her rivals.